Want to know what the language of faith sounds like? Join Joseph Prince in this exciting exposition of what God's language of faith is. Learn how saying good things and speaking out what you believe in Christ can cause you to experience the miracles you are trusting God for. Understand the importance of acknowledging that you already have what you asked God for in prayer even when you still can't see or touch it. Also, break free of the cycle of negative, defeatist thoughts as you learn how you can develop a confident expectation of God's goodness toward you every day. This powerful series of DVD messages will help you to receive the breakthrough you need as you begin to expect good and speak God's language of faith! 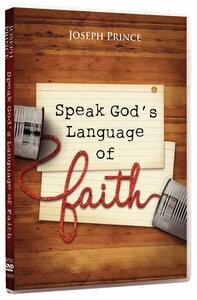 About "Speak God's Language of Faith (3 Dvds)"